Almost Home offers a wide variety of San Diego, CA corporate housing options for every short or long term furnished apartment need you may have. Contact us today to receive a temporary housing quote customized just for you in your desired area of the city. We wish to help familiarize potential newcomers to life in San Diego and therefore provide the following informative summary of various aspects of this city. Take a few moments to acquire the knowledge of a long-time resident before you arrive. Those staying in corporate housing in San Diego, CA for business reasons might appreciate some information about the city’s business environment. San Diego is the eighth largest city in the United States and supports a robust economy that is spread across a diverse array of industries and sectors. Its revenue stream originates from public, private and academic sectors, as well as from military research and commercial activities. Defense and military activities form the bedrock of the economy, making the Federal government responsible for the largest single source of employment. Specifically, the US Navy, responsible for the Pacific fleet is located here and is part of a number of other military installations. San Diego is also home to a large intelligent communication environment. It is also the center for life science research and development. Both industries are responsible for the employment of a large section of the skilled workforce and generate a high end commercial economy downstream. Companies such as Qualcomm are headquartered here and so are international giants such as LG, Nokia and Novatel. The rapid development, the high-end employment and the diversity of the economy naturally lead to a real estate market that is vibrant. Before the financial crisis, San Diego experienced 300% price appreciation in a decade for single family homes. The prices and demand have tempered since the financial crisis; however, prices are still above the national average. Knowing what clothing to bring with you to your San Diego, CA furnished apartment is somewhat dependent on the local climate. San Diego experiences a combination of Mediterranean and semi-arid climate. Summers, which range between 69º and 77º, last between May and September with the highest temperatures experienced in August. Rainfall is highest during the cooler months between December and March. Fall temperatures average at a high of 73° in October, then cool down to lows of 49° in December. So, be sure to dress right and then venture out of your San Diego, CA corporate apartment to enjoy the wide variety of outdoor activities that this area offers. Being a temporary resident in San Diego, CA corporate housing need not relegate you to feeling like a complete outsider. Acquaint yourself with San Diego’s history by reading our brief historical summary provided below. The San Diego area was originally inhabited by Native American tribes called the Kumeyaay. They were also known as the San Dieguito. They gave way to the Spanish under Juan Rodriguez Cabrillo on 1542, who claimed the area for the Spanish crown. It was then named San Miguel. Sixty years later, another Spaniard arrived to map the area. Sebastian Vizcaino, arrived on his ship the San Diego, which docked at present-day Mission Bay. He named the area San Diego in honor of the Saint Didacus, known affectionately in Spain as San Diego. Two hundred years after Cabrillo arrived, Mexico gained its independence and along with it received the state of Alta California, wherein was located San Diego. The Mission in San Diego during the time of the Spanish was slowly converted and the city grew rapidly closer to the coastline than to the hills where the mission was located. When California was admitted to the United States in 1850, San Diego was passed along with it and became the country seat for the San Diego County. This served to increase its growth rate, and San Diego slowly became more entrenched in its location by the coastline. The old San Diego location is currently a historical preservation. Sushi Ota on Mission Bay Dr.: Sushi Ota is a sushi bar that specializes in sushi and sashimi. They serve authentically prepared dishes using fresh catch and top quality ingredients. The salmon belly is popular here. The restaurant is open for lunch until 2 pm, then again for dinner between 5pm and 10.30 pm. Sit at the sushi bar if you can. Assenti's Pizza on India St.: Assenti's is a meat and cheese deli that serves food as well. They even sell pine nuts by the pound. The popular dishes here include the squid ink linguini. They are open daily till 6pm and closed on Sundays. They offer takeout and have ample parking. Hanna's Gourmet on Adams Ave.: Hana's is a moderately priced European-themed restaurant that serves delicious desserts to complement their main menu. The Burgers here, with many varieties, are popular among the frequent visitors. They are open for lunch and dinner daily except Mondays and Tuesdays. Carmita's Snack Shack on University Ave.: Carmita's serves an inexpensive menu that is filled with local favorites such as pulled pork, pork belly chinks and steaks. They are open for lunch daily. There is no alcohol on the premises. Tandoori House on Midway Dr.: Tandoori House is popular in this part of San Diego. The serve authentic Indian cuisine spiced to mild perfection. Try their Samosas from the appetizer menu or the Chicken Tikka Masala from the main menu. They also offer delivery and pick up. 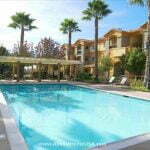 Stepping out of your San Diego, CA temporary housing is bound to present you with numerous interesting activities. We have listed a few possible entertainment options that may appeal to you. Museum: The Museum of Contemporary Art in San Diego has two locations. One is on La Jolla and the other at Santa Fe Depot. It is interesting because the Santa Fe location has two complexes, each across the street from the other. They showcase a significant collection of print art and contemporary styles alongside other media and classical works that tour the country when not on display. Performing Arts Theater: The Starlight in Balboa Park is a famous haunt for those who appreciate live performances. They have an active schedule throughout the year featuring shows like Hello Dolly and Annie. The stage is well designed and the acoustics are well engineered. Parks: Old Town San Diego Park presents life as it was in the recent past. It is a way to understand the history of the land and take part in live action. There are adobe homes and people dressed in costumes representing the times of the Spanish settlements.